San Francisco’s historic Hotel Triton has unveiled a fully renovated property. The hotel is located in the Grant Avenue Corridor and San Francisco’s Financial District. 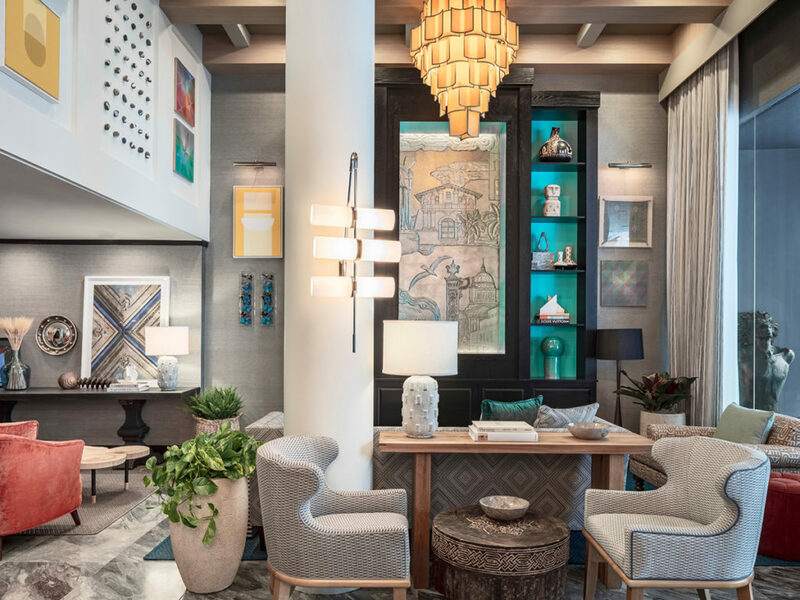 Following a year of work by designer Liubasha Rose and Rose Ink Workshop, the revitalized property has an art collection and 140 renovated rooms. The Hyatt Regency John Wayne Airport Newport Beach has completed its renovation. Between Los Angeles and San Diego, the hotel has 28,000 sq. ft. of newly redesigned function space including 20,000 sq. ft. of indoor/outdoor venues, food and beverage options, 343 guestrooms and suites, a pool and fitness center. RLH Corporation has signed a franchise license agreement for a Signature hotel in Temecula, CA. The hotel will undergo a refresh to its guestrooms and common areas. Signature Temecula will be located near old town Temecula’s antique shops and restaurants with access to 23 Temecula Valley wineries. Signature Temecula is anticipated to open this summer. The Ridgeline Hotel Estes Park is the latest property to join the Ascend Hotel Collection by Choice Hotels International Inc. Located in Estes Park, CO, the upscale boutique hotel offers access to Rocky Mountain National Park. Owned and operated by Delaware North, the 147-room hotel recently completed a multimillion-dollar renovation. The property has more than 20,000 sq. ft. of indoor/outdoor meeting and event space, a pool, food and beverage outlets and fitness center. In addition to its in-house event space, the Ridgeline Hotel is attached to the Estes Park Conference Center, which allows the property to accommodate large groups. The Armstrong Hotel in Fort Collins, CO will be undergoing a complete interior redesign and renewal to debut in early spring. On Jan. 1, hotel temporarily closed to undergo a full property restoration, expanding the lobby space and doing a complete interior refresh that will combine the traditional Art Deco architectural details of the original historic building with updated, refreshed decor and an updated lounge. Holiday Inn Denver East—Stapleton has completed a $12.8-million renovation project that began in March 2017. The entire hotel was renovated, including 298 guestrooms; 20,000 sq. ft. of meeting space; 3,210 sq. ft. of public spaces; and the hotel’s restaurant, Burgers & Crafts. The hotel is close to Denver International Airport and downtown Denver.